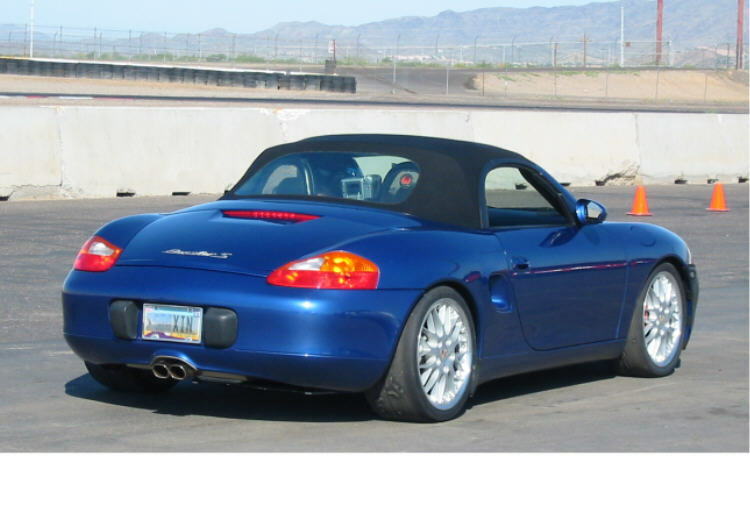 We started with a 2002 Boxster S in 2005 - AX, DE - added Momo race seats, harness, BK Roll bar extension, lowering springs, 18" wheels W/ 888s, power steering fluid cooler . . . Father and son thru DE4 - now son has '78 911 race car since 2008 - and Boxster converted back to street car and a few track DEs - 115K miles and no IM problems - Amsoil 10-40 . . . Just drove 1600 miles RT to Rennsport VI fun at 80+ mph . 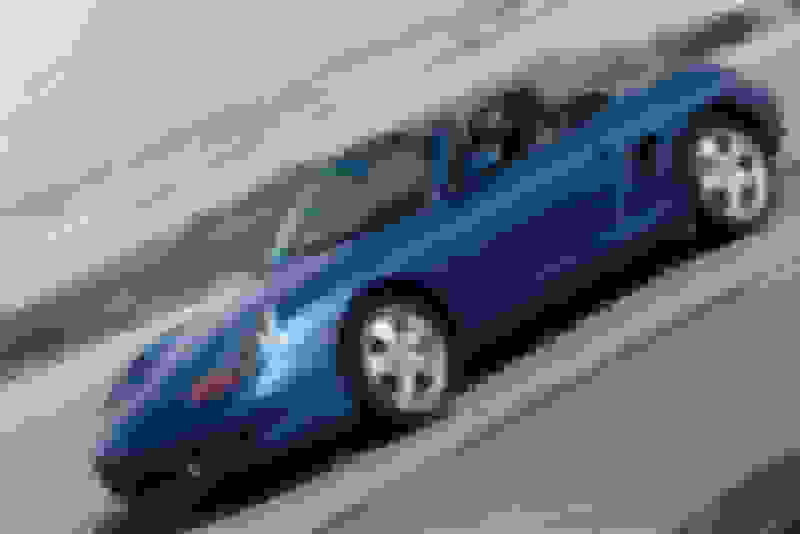 . .
Photo of Street car on track with top down - great fun. And, photo of track set up in 2007 . . . 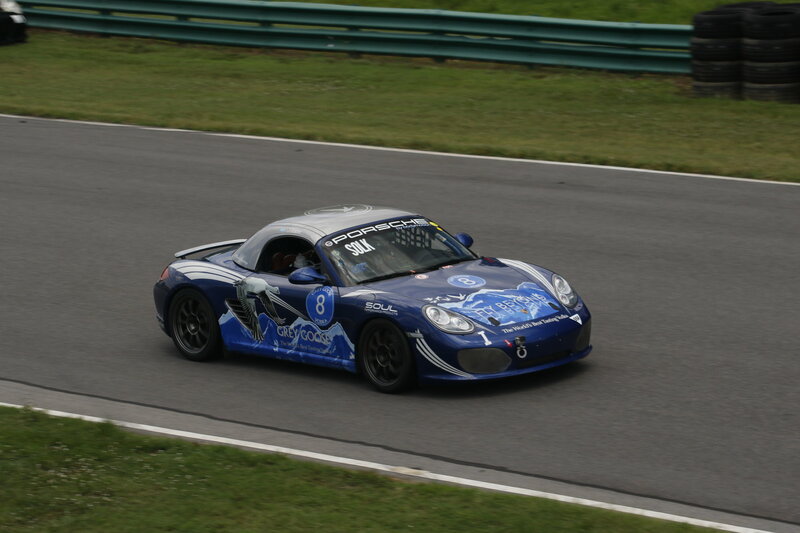 I've been running Boxster Spyders without the top on racetracks for years and never had a problem (other than rain). Wind, air pressure, etc., are non-issues. It can get chilly on cold wintry days, but I just layer up and turn the heat on. It's actually not much different than a coupe with windows open. Besides, you warm up very quickly and sweat when you're driving on the track. At least I do. Now, the reason I began running with the top down in Spyder is because Porsche says not to go above 120 mph with the top on. If you have a non-Spyder Boxster track car, there is no reason to run with the top down, i.e. run with the top up. I know folks who wear arm restraints all the time get used to it, but it doesn't seem like the most comfortable feeling in the world. With the OP having been racing and now moving to DEs, they may wish to keep in mind that for DE s restraints can be problematic wrt point bys. Another cost item to keep in mind for DEs is the incremental difference in HPDE insurance costs for GT4 vs GT3 vs SP996 vs SPB. My buddy who tracked a GT4 was paying $800 per wknd versus the Boxsters which cost about $400 per weekend. The same is true for transportation/storage and liability insurance coverage. 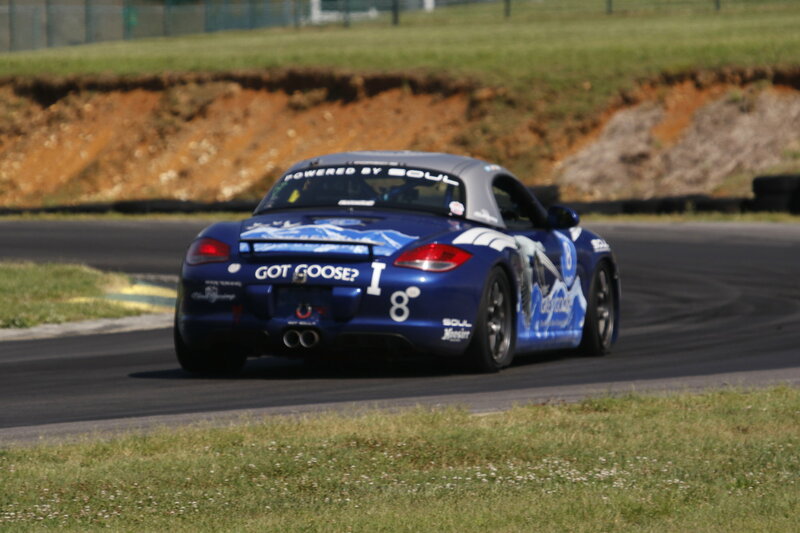 Wasn't there an Rlister a ways back that tracked the pooh out of a leased Boxster? Paul, I've always wondered: why the Grey Goose? It wasn't the plan actually but there are some beautiful Martini examples out there already, I drink Goose not Martini and I thought the artwork of the bottle would actually compliment the color of the car really well. ..but two months later, I added an old Boxster S as I was missing "no roof" and a stick shift (the only thing I did not liked about the Panamera was PDK). It is true that you also “need” a "Cayenne" to tow the Boxster to track, as the Panamera will no do that. Back to the Boxster, those days, only PCA require arms restraint for open roof, but to my Californian experience, plenty of other organizers are more open minded. 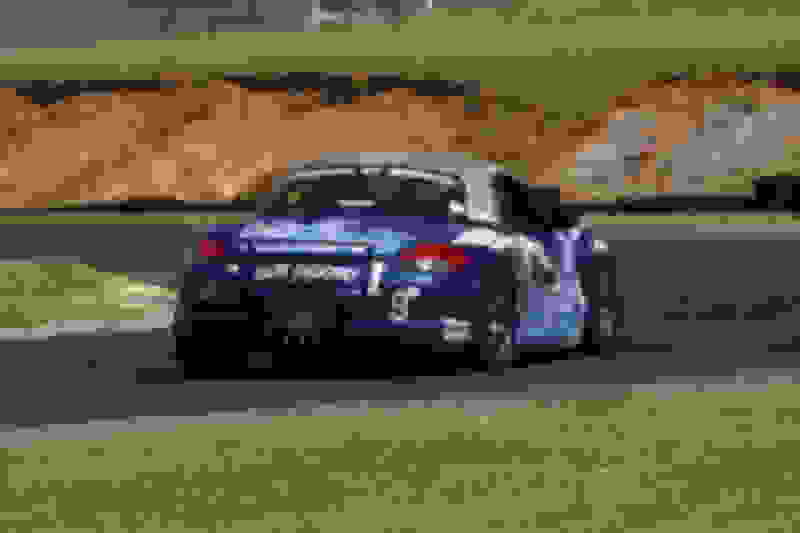 (Hey, on track, we all drive side windows down (btw, down or up, these are glass, and will not last long in case of severe problem, ..or: down or up = no changes). If you think that on a bad roll, the "Captain Hook" risk is not present on any "coupe", let me recall you that physic is such that in the bad case of a roll, before being on the roof, ..a car spend some time on the side. And, in addition to that, if you think that a thin skin roof, ..or a roof made with canvas will protect your hands, well, ..in my opinion, only the PCA deciding entity can think this way. I even think that a skin roof could be worse than open, as one may feel that this “thing” could protect. Still, if you want to be safe at 100%, I would recommend then to NOT enter in a car on any road. It is also true that the safest track equipment is full roll cage AND Nets. But, no way to have a “fun and track” car being equipped this way. Or, the need to ..looking for compromises ! PS : If you ask me why I do not drive with the top up on track, my answer is simple : no more top, ..because there is a 6 points roll bar at the place of the canvas roof. Last edited by GVA-SFO; 10-23-2018 at 02:40 PM. I can verify it holds up to at least 132mph with the back insert removed. Looking at the way the top is configured, I think the limiting factor is not the large top piece but the backing. There isn't any more noise than a coupe really because you need to run windows open anyway. My advice is check with the track or group you plan to run with - some will not take anything without a hard top, others will. Some require arm restraints, some don't. Most that allow verts that I have talked to allow them if they have the standard factory rollover protection in them. If you are streeting the car, the extra roll bar/harness can be a problem from what I understand. This is all really great info, thanks very much. I'm still gathering my facts and weighing options, but being able to gain valuable knowledge from the collective experiences is why I appreciate this forum.